Not All Raw Milk Is The Same! How can that be? It all comes from cows, right? Yes, but that's where the similarity ends. The truth is, there are actually two types of raw milk here in America: the one meant to be consumed directly from the cow, and the one that absolutely must be pasteurized first due to the conditions under which it was produced. The ideal raw milk is taken straight from animals fed only fresh, organic, green grass, rapidly cooled to somewhere around 36-38 degrees F., and bottled. That's it. No processing, just filtration, and cooling. Most milk produced today undergoes some form of processing before it reaches the consumer. 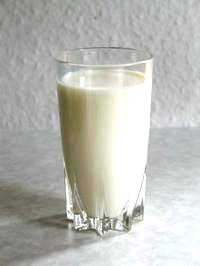 Diet is a major factor in the quality of raw milk. Studies have shown that over-feeding starchy grains can affect the acidity of the cow's stomach environment and change fat and nutrient levels (1,2). Raw milk from cows fed a large component of grain is just not as optimal a food as grass-fed and lacks many of milk's self-protective properties. Milk like this, potentially more easily contaminated, should be tested regularly, as should all raw milk, for that matter. Many non-grass foods (such as soy and alfalfa) contain compounds that mimic the actions of the female hormone, estrogen (3). While these can cause cows to produce more milk than they normally would (and thus increase profit per animal), some studies have called into question possible impacts on animal health and nutrient content of the milk. Cows are ruminants, with a complex digestive system designed to break down cellulose, a type of structural sugar indigestible to humans, and other substances found in the cell walls of grasses and other green plants they're likely to encounter while grazing. Prior to the advent of organized agriculture about 10,000 years ago, there simply weren't fields of grain growing wild, upon which animals could munch. As mentioned above, a heavy starch load of grain can alter the usual conditions in a cow's rumen (stomach) and affect the composition of its milk. Milk from grass-fed cows has amazing properties, one of which is the presence of naturally produced antimicrobials in solution (5). Another is the production of a beneficial fatty acid known as CLA, short for Conjugated Linoleic Acid (6,7). Countless studies have shown that CLA has many potential health benefits. For comparison, grain-fed cows have as little as one fifth the CLA in their milk as grass-fed (8). Some raw milk can make you very, very ill. Drinking milk destined for the pasteurizer before it's sterilized can be like playing Russian roulette, but with ALL the barrels loaded. Why? Mainly because cleanliness standards are far lower for milk which will eventually be heat treated. In large operations, there simply isn't enough open pasture land to contain and grass-feed hundreds of animals, so they're often confined in manure-laden pens. Supercows, bred for hyperactive pituitary glands or injected with stimulant hormones (such as Posilac) produce an elevated quantity (as high as 13 gallons) of milk daily, leading to inflamed teats. This condition, known as mastitis, pumps high numbers of white blood cells, or pus, into the milk (9). Add the potential of toxic drug residues, antibiotics, larvicides (10), pesticides (11,12), fertilizers and heavy metals (13) and you have quite a witches brew. Many of the outbreaks of food related illnesses blamed on raw milk can be traced to just such product somehow bypassing the pasteurization process. You can see why humans have no business consuming raw milk produced by the large factory farm complexes that dominate the industry today. It's simply not safe for human consumption before it's processed. The role of unclean raw milk in human illness is undeniable. Knowing that not all raw milk is the same is the first step in knowing which questions to ask when you seek it out for yourself and your family. In the following clip, Dr. William Campbell Douglass sheds more light on how to inform yourself about raw milk and nutrition. (6) Dhiman, T. R., Anand, G. R., Satter, L. D., Pariza, M. W., 1999. Conjugated Linoleic Acid Content of Milk from Cows Fed Different Diets. J Dairy Sci 82:2146-56. (7) Couvreur, S., Hurtau, C., Lopez, C., Delaby, L., Peyraud, J.L., 2006. The Linear Relationship between the Proportion of Fresh Grass in the Cow Diet, Milk Fatty Acid Composition, and Butter Properties. J Dairy Sci 89:1956–1969. (8) Grummer, R. R., 1991. Effect of Feed on the Composition of Milk Fat. J Dairy Sci 74:3244-57.